All of the 73 Year 6 pupils helped to make Tim Rice and Andrew Lloyd Webber’s timeless musical a rip-roaring spectacle for packed houses on three fabulous nights. Director and Choreographer Alison Lea said: “This musical is particularly challenging to the young performer, as the action and music is non-stop with all company members fully involved in telling the story. 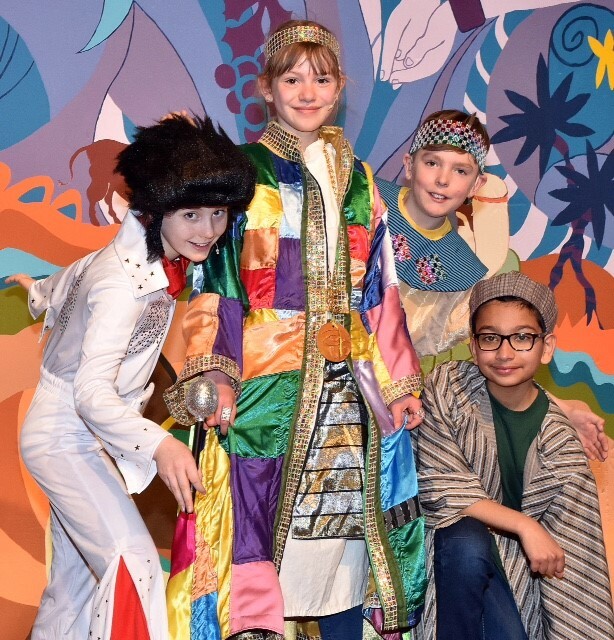 Highlights for the pupils were ‘Go, go, go Joseph’ which featured stunts from some of King’s talented gymnasts and ‘Song of the King’ with Pharoah presented as The King of Rock and Roll, Elvis Presley. They were also spurred on by a special good luck message from Phillip Schofield, who played Joseph in the West End version of the musical. He recorded a video message for them, reciting all the colours of the coat, which the children watched before taking to the stage themselves. Pictured are Marianne Knuckey as Joseph, Emilia Pearce as Pharoah (Elvis), Jack Smith as Potiphar and Abdullah Atif as Jacob.